For protecting the copyright of our confidential PDF document, some people would like to add draft & signature to PDF documents. 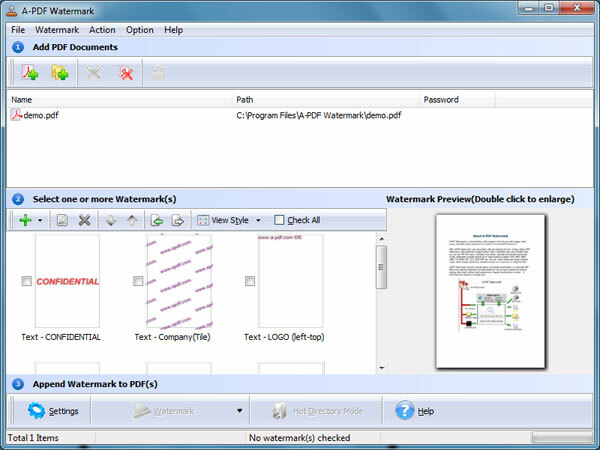 We know that A-PDF provides A-PDF Watermark tool for us to add text or image stamp to PDF document, for Windows. But some people would like to use this tool on their Mac OS computer. If you are a Mac user, you may want to know that: can I add text or image stamp/watermark to my confidential PDF document on Mac? I think PDF Stamp Mac (A-PDF Watermark for Mac) is the best solution. PDF Stamp Mac is a powerful and effective Mac tool for copyright PDF document with text/image/PDF/shape/dynamic datetime. Some of our PDF record the confidential information that we do not want all people have the permission to read. How can we control the permission? How can we protect out PDF document copyright for avoiding people who do not allow access to reading? The best solution is to use PDF Stamp Mac software, add text or image watermark to all or specific PDF pages. You can add different kinds of watermark: text, image, PDF, shape and dynamic datetime. All those watermarks you have created will list on the preview panel. You can add one or more watermarks to your PDF documents, no matter text/image/PDF/shape/dynamic datetime watermark. You have the full control of the permission of PDF. If you hope readers link to your website, you can also add link to those watermarks, so that when readers click on the text/logo watermark, they can open your website to learn more.